Perhaps the primary theme of the novel is that evil can only be resisted psychically: when the rational controls that order man's existence slacken, destruction comes. Conrad said it best in "Heart of Darkness," but Mr. Doctorow has said it impressively. His book is taut and dramatic, exciting and successfully symbolic. ^ "Welcome to Hard Times". Turner Classic Movies. Atlanta: Turner Broadcasting System (Time Warner). Retrieved August 18, 2016. ^ Abrams, David (July 22, 2015). 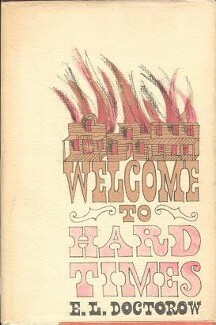 "Welcome to Hard Times". The Quivering Pen. Retrieved 2015-07-29. ^ Williams, Wirt (September 25, 1960). "Welcome to Hard Times". The New York Times. Retrieved 2009-02-07. This article about a novel in the Western genre of the 1960s is a stub. You can help Wikipedia by expanding it. This page was last edited on 2 April 2018, at 18:02 (UTC).